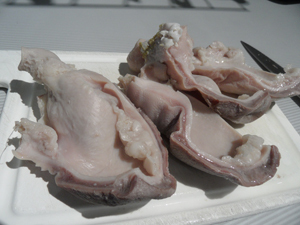 I cooked this dish sometime towards the end of last year. I had serious dim sum cravings, particularly for this saucy, tasty and tender pork stomach dish. So I tried recreating it and look what I had. This isn’t for everybody though, another one for my ‘secret pot’. 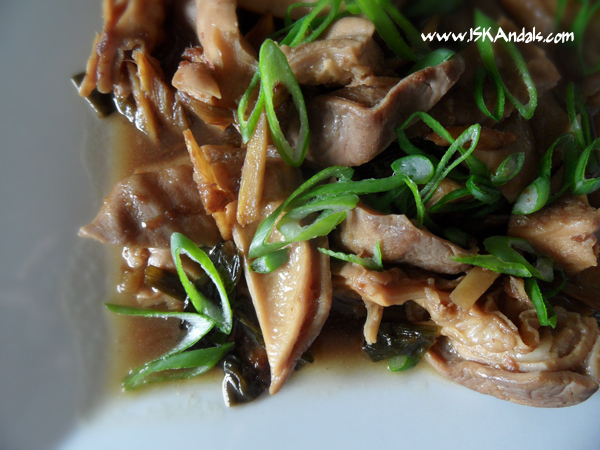 Having said that, this kitchen experiment has inspired Erwin to make a dish out of pork stomach. Bring a large pot of water to boil. 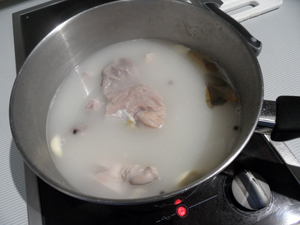 Add pig stomach and boil for about 5 minutes. Drain the pig stomach and discard the water. Put the stomach back into the pot. Cover with enough water to submerge. Add peppercorns and bay leaves. Bring to boil then simmer for about 2 hours or until fork tender. Don’t forget to add a bit of salt midway through cooking. When done, scoop out the stomach and reserve broth. 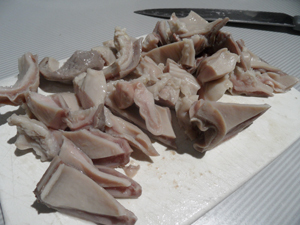 Slice pork stomach into thin bite size pieces. Set aside. Heat oil in a wok. 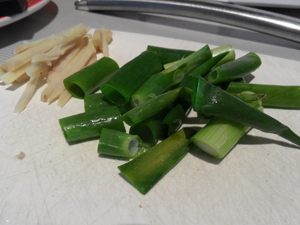 Fry garlic, ginger and chopped spring onion until fragrant. Add stomach slices and stir-fry for about a minute to brown. 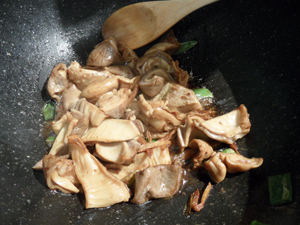 Add soy sauce, patis, rice wine vinegar, cooking wine and sesame oil, and stir-fry for about 3 minutes. 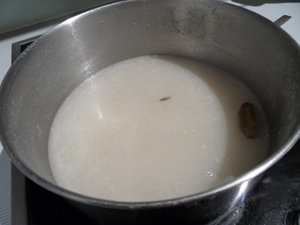 Add 1 1/2 to 2 cups of the reserved broth (or plain water). Simmer for about 30 minutes or until slightly reduced. Serve garnished with spring onion. ooh, interesting ingredient! would love to give it a taste…. 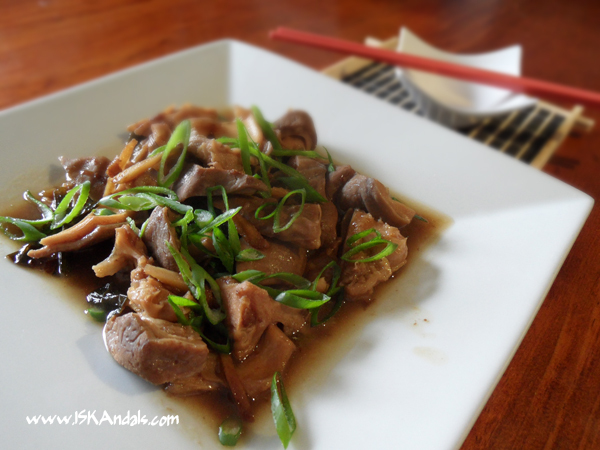 pig stomach—is not liempo, right? :p well, it doesn’t look like liempo. I don’t think I have tasted pork stomach yet. Nakaka-intriga naman ito, parang gusto ko rin iluto. Makapagtanong nga sa palengke kung meron silang pork stomach. Pwede rin kaya ito sa intestines? 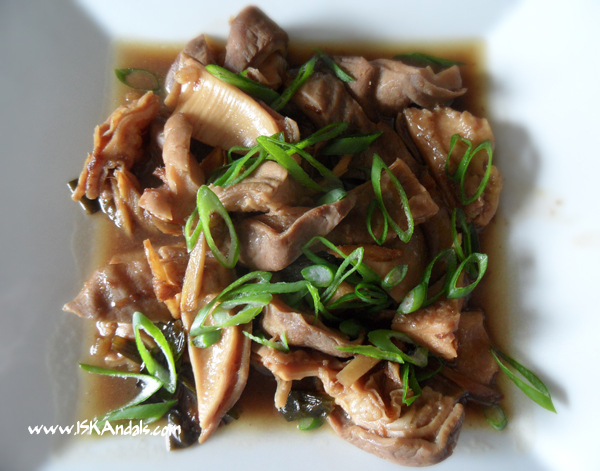 Hi Jenn, I think it’s perfectly all right to use pork intestines. I’m pretty sure masarap pa din yun! 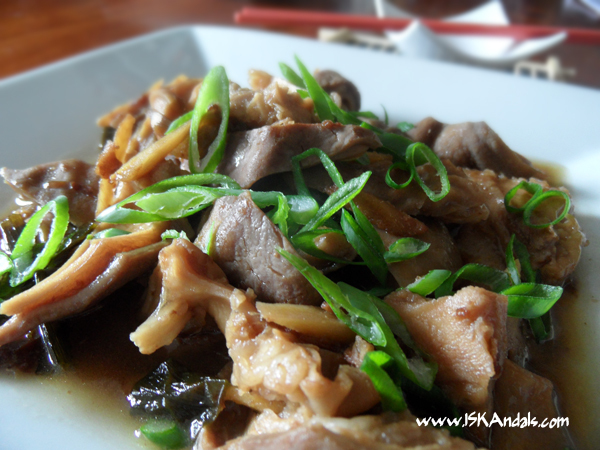 the layman’s term for pork stomach is ti-to. i need to try this recipe, this is looks great perfect for pulutan! thanks iska! Thank you for the info, Alvin! Hindi ko alam yang ti-to.